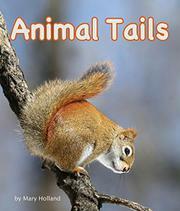 A fascinating up-close look at the many uses animals have for their tails. Frogs and toads start out with tails that help them swim but lose them as they grow and move to living on land. Deer use their tails as flags to warn others of danger. Beavers do this as well, plus they use their wide tails to steer, store fat, and balance. Everyone knows that a skunk’s lifted tail is a sign of imminent trouble, and the prehensile tails of opossums help them grasp tree branches. When it’s cold, a fox uses its bushy tail as a blanket. Muskrats and birds use their tails as rudders to help them steer, one through water, the other through the sky. And porcupines and bees use their tails for defense. Holland’s photos are a highlight, filling three-quarters of each page and sometimes including inset pictures—of the skunk’s rear with tail raised and of the beaver in midslap. Readers can see individual hairs and feathers and will want to curl up with the adorable fox. But two photographed animals have no accompanying text: the red squirrel on the cover and the snake in the opening spread. The “For Creative Minds” section in the back invites readers to match animals to their tails and describes the tail adaptations of flying squirrels, salamanders, fireflies, bats, and otters. A Spanish-language edition, Las colas de los animales, publishes simultaneously.